Making the decision to get a divorce isn’t easy, and having to tell your children doesn’t make it any easier. Talking to your kids about divorce—with your spouse, if possible—is imperative. And it’s certainly not a conversation to take lightly. The way you approach the conversation and the things you say will have a big impact on how your child views the divorce, and that could make a difference in how he copes with the upcoming changes in your family. 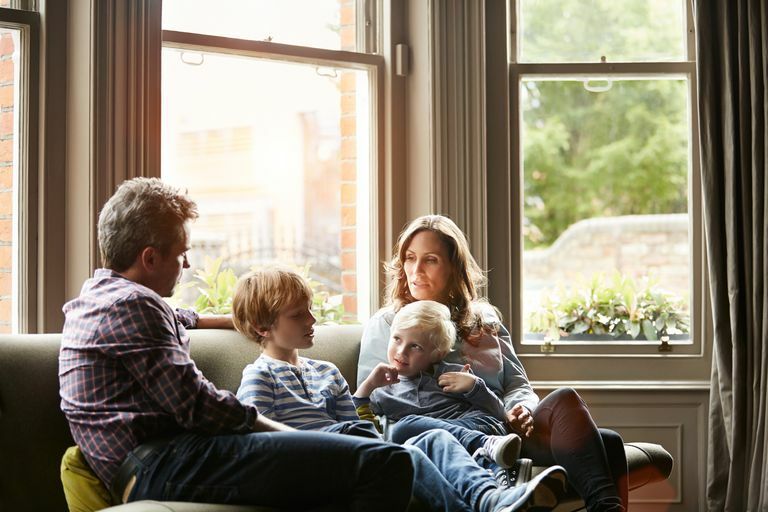 It might be hard to spend time with your soon-to-be ex-spouse; however, at this point, the two of you need to still form a team to support your children. It’s best if you can work together to write out the main talking points of the conversation, so both of you are on the same page and will give the same answers to questions that will surely be asked. If the two of you really can’t bear to be in the same place to tell your children about the divorce, you still need to have a discussion about what the kids need to know and make the same pledges about treating each other with respect. When the conversation about divorce occurs with each parent, they should be reiterating what the other parent has said. Give a lot of thought to when and where you should have a conversation with your children. You want to give them enough time to ask questions and adjust before changes are made, and you want to do so in a quiet location that doesn’t have distractions. Ideally, talk to your children about your divorce two to three weeks before you and your spouse actually separate—you don’t want one parent to move out immediately after the conversation. The children will need time to adjust and ask questions, so consider talking to them at the beginning of the weekend. That way, you’re around to talk if they want to discuss the divorce further and they’ll have a couple of days to think about it before they head back to school. This one is easy—tell everyone at the same time. It’s tempting to only tell an older child and shelter the baby of the family; however, then you put the burden of secret-keeping on the eldest. Even if you don’t think a younger child will understand, gather the whole family at once for the conversation about the divorce. This isn’t the time or place to get into the nitty-gritty of why you’re divorcing. Blaming doesn’t belong here. Make your message clear and simple: We have decided we can’t live together anymore. This was not an easy decision but was important to make. We both love you very, very much, and the decision to separate has nothing to do with you. Reiterate that the divorce is no one’s fault—especially your child’s—and you will still be a family, just in a different way. Reassure your children that they will see both of you, and you will continue to love them just as much as you ever did. And don’t be surprised if your child acts like he doesn't care that you're getting divorced. It may take a while for the gravity of the situation to fully sink in. Your child will grieve the changes that accompany divorce in his own way. He may be sad one day because you aren’t together and excited the next day because he realizes he’s going to have two bedrooms. Let your child know that whatever he feels is OK, even though some of those emotions may be uncomfortable sometimes. You might consider telling your children’s teachers about the divorce the day before you decide to have the conversation. This prepares the teacher for any potential behavioral fallout, which she can report back to you. Of course, ask the teacher to be discreet with the information and refrain from talking to the child about it, unless he brings it up on his own. Most teachers will appreciate knowing what’s going on in the home. You should also inform any other caregivers that you’ve broken the news to your children. Daycare providers, coaches, or other adults who supervise your children can help evaluate how the news is affecting your child in other settings. Preschoolers - anxiety, clinginess or steps backward in development, such as waking up in the middle of the night or having accidents. Elementary school children - fear, anger or anxiety, increased behavior problems, and a major decline in school performance. Teenagers – aggressive and delinquent behavior, withdrawal, inappropriate sexual behavior, substance use, and poor school performance. If your child is struggling to adjust to the changes, seek professional help. Talk to your child’s doctor or contact a mental health professional. Freeman BW. Children of Divorce: The Differential Diagnosis of Contact Refusal. Child and Adolescent Psychiatric Clinics of North America. 2011;20(3):467-477. HealthyChildren.org: How to Talk to Your Children About Divorce. Mcadams TA, Neiderhiser JM, Rijsdijk FV, Narusyte J, Lichtenstein P, Eley TC. Accounting for genetic and environmental confounds in associations between parent and child characteristics: A systematic review of children-of-twins studies. Psychological Bulletin. 2014;140(4):1138-1173.